Kathy Meyer never expected the reaction she got when she painted the White House, pink. "I just thought white was boring," she explains matter-of-factly. The project was an assignment in her second grade art class, but freedom of creative expression was not on the agenda. Kathy's teacher thought she was terribly wrong for changing the color of America's most famous house, and found her deviation so offense that she sent the little girl to the corner. Rather than being traumatized by the situation, however, Kathy was piqued by it. She was fascinated by her teacher's reaction, and with the power of art. "I loved that it could evoke so much emotion, " she says, "and I liked the fact that you could change anything you wanted with it. Things didn't have to be the way they had always been." When people would say, 'You're so different', I would take it as a compliment," she says. "I don't want to be like everyone else." This confidence helped keep her focused on her art, and even when faced with negative comments about her pursuits, she defended herself. One such incident took place at a meeting with a high school counselor during her senior year. "He told me I would never make any money being an artist," she recalls. "I think the only artists he ever thought about were the fine artists working with oils on canvas." Instead of getting angry or dejected, she simply informed him otherwise. "I told him the cereal he had eaten that morning had come from a box designed by an artist ... and the car he had driven to school had been designed by an artist ... and the text books we used were designed by artists." 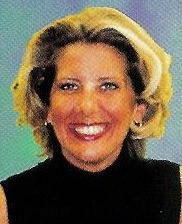 Kathy has studied interior design and also earned a degree in commercial art. She has done commissioned artwork for private clients but wanted to bring something fun and different into the needlepoint industry, and she wanted to combine it with fabric in some way. Though her bright colors, funky shapes and simply wild ideas are nothing like those typically found on fabric or in Needlepoint, they have captivated, charmed and won fans wherever they are found. Kathy lives in South Saint Paul, Minnesota with her son, Christopher. written by Michelle Howard for Stitcher's World Magazine. .